Cree Indian Leader. A noted leader and great warrior, Big Bear was born about 1825 near Fort Carlton to the Cree-Ojibwa chief Black Powder. Eventually becoming a Cree leader, and spokesman for discontented Indians, Big Bear refused to sign Treaty six in 1876, linking it as bait meant to trap the Indians. By 1884, he was convinced that any form of overt resistance to the white man was futile. He then cooperated with another Cree leader, Poundmaker, and urged united Indian action, in an attempt to get a better deal from the Canadian Government. Big Bear's peaceful ambitions caused dissent within his band and he lost influence and authority to more aggressive followers, who were prepared to fight to accomplish a restitution of Indian grievances. During the spring and summer of 1885 be was unable to restrain his band and on two occasions his followers resorted to violence, killing nine white settlers at Frog Lake and burning Fort Pitt. Big Bear, although showing personal restraint throughout, was nevertheless considered by the authorities the leader of his band. He spent the two years following the rebellion in prison, convicted of treason-felony. He was released in the winter of 1887-88, moving to the Little Pine reservation, where he was reported to be ill and refusing all medical aid. Big Bear, visibly crushed at the loss of a traditional life style and disillusioned by his failure to unite his people, lost the will to live and died quietly the following spring. Native American Chief. Big Foot and his people lived on the Cheyenne River Reservation in South Dakota and were among the strongest believers in the Ghost Dance ceremony when it arrived among the Lakota in the spring of 1890. The hunger and misery that had followed the final break-up of the reservation in 1889 made the Lakota keenly receptive to the Ghost Dance message of messianic renewal, and the movement swept rapidly through their encampments, causing local Indian Agents to react with alarm. Some effectively suppressed the dancers, others called for troops to restore order. At the Standing Rock reservation, where Sitting Bull was suspected of encouraging the Ghost Dance in order to provoke an uprising, the crisis led to bloodshed when Indian police sent to arrest the aging holy man killed him in a confrontation with his followers. Fearful of reprisals, many from Sitting Bull's band fled south, where they found haven with Big Foot. Big Foot decided to lead his people away from the possibility of further violence and headed farther south toward the reservation at Pine Ridge, hoping to find safety there. Increasingly ill with pneumonia, he had no intention of fighting and was flying a white flag when soldiers patrolling for roving bands caught up with him on December 28, 1890. That night Big Foot and his people camped near Wounded Knee Creek, surrounded on all sides by soldiers. The next morning, the soldiers set up several large Hotchkiss guns on a hill overlooking the camp and began confiscating the Indians' weapons. When a gun accidentally went off, they opened fire, and within a few minutes, some 370 Lakota lay dead. The soldiers even pursued fleeing women and children, shooting some as far as two miles from the site of the original confrontation. Big Foot himself was among the first to die. His frozen body, half raised as though trying to warn his people of their imminent disaster, lay untouched for three days until it was unceremoniously dumped into a mass grave. Native American Kiowa Chief. 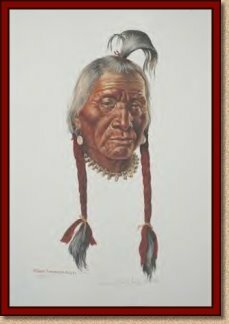 His name was Tene-angop'te which means "The Kicking Bird" and he was of mixed Crow and Kiowa ancestry. He rose to prominence in his late twenties as chief of the united Kiowa bands and assumed the leadership of the tribe's "peace faction". On August 15, 1865, he signed a peace treaty with American authorities at Wichita. He also took part in negotiations that resulted in the signing of the Medicine Lodge Treaty on October 21, 1867. Under the terms of this treaty the Kiowa tribe moved to a reservation at Fort Sill, Oklahoma. When the government did not keep to treaty promises the Kiowa tribe became divided and he was accused of being a coward. His leadership waning, in July 1870, he led a raiding party through Texas and successfully defeated Captain Curwen B. McClellan of the Sixth Cavalry who was sent to capture him. Peace was still his main objective and when he returned to the reservation he attempted to persuade his people to live peacefully with white settlers. In early 1875 the United States Army named him principal chief of Kiowa affairs. His abilities were not enough to quell a rising sense of dissatisfaction over reservation conditions and problems. Sauk Indian Leader. Indian Chief Black Hawk died in 1832 and was buried on James Jordan's farm near Iowaville. On July 3, 1839, James Turner, a local dentist, stole the corpse, fled to Quincy, Illinois, cooked off the flesh in a hog-scalding kettle, and prepared to exhibit the skeleton. The Iowa governor insisted on its return, then gave the skeleton to a physician friend, who kept it here in his Burlington office. A fire destroyed both office and bones in 1855. Chief Bowles was born in North Carolina about 1756. Settlers from a North Carolina settlement killed Bowles father when Bowles was a young boy and that the vengeful fourteen year old killed his fathers murderers. Chief Bowles and his people lived in the valley of the St. Francis in southeast Missouri until 1811. During that year there was a violent earthquake. The ground shook and sank in many places. The Bowles and many of his people thought that the Great Spirit was warning them to move. Many then moved to Arkansas. Other Cherokees began to move to Arkansas and by 1813 about one third of the Eastern tribe was living west of the Mississippi. In Texas Chief Bowles became the primary "civil" chief or "peace chief" of a council that united several Cherokee villages. In 1822 he sent diplomatic Chief Richard Fields to Mexico to negotiate with the Spanish government for a land grant or title to land occupied by Cherokees in East Texas. In 1827 he cooperated with the Mexican government in putting down the Fredonian Rebellion. In 1833 he made another attempt to secure from the Mexican government land on the Angelina, Neches, and Trinity rivers, but negotiations were interrupted by political unrest in Texas. In February of 1836 Sam Houston negotiated a treaty with Bowl's council, guaranteeing the tribe possession of lands occupied in East Texas. After the Texas Revolution, however, the treaty was invalidated by the Senate of the Republic of Texas. In desperation, Bowles briefly allied with agents soliciting allies for a Mexican reinvasion of Texas. Shortly thereafter, President Mirabeau B. Lamar ordered him and his people to leave Texas. After negotiations failed, Bowl mobilized his warriors to resist expulsion. On July 16, 1839, Chief Bowles was killed in the battle of the Neches. His body was left where it lay. Arapaho Scout. He delivered messages and acted as a mediator between Native Americans and European Settlers. He rode with the US Army but did not carry a military title. Clallam Indian chief who befriended the early settlers of Port Townsend. Referred to during his lifetime as the Duke of York. Actual date of birth unknown. "Cochise," derived from the Apache word "cheis," or "oak," led his Chokonen Apaches (rising sun people), often called Chiricahuas, through their first conflicts and dealings with the United States. He was among the most powerful and respected of Apache leaders and his influence extended far beyond his own band. He was one of the few Apache leaders whose influence transcended his own band and could bring together many of the diverse family groups that made up the loose bands we now call "Apaches." No photo of him is known to exist. He was reportedly a tall, broad shouldered man of power, dignity and grace. After about ten years of war against the United States, Cochise finally made peace with the United States on nearly his own terms in 1872, and entered reservation life on a portion of his own lands in what is now southeastern Arizona near the site of Fort Bowie. Attorney who fought the United States government when they attempted to confiscate land that had an Indian burial ground of the Wyandotte tribe on it. The land which is in the middle of the downtown Kansas City, Kansas shopping area, is prime real estate. Her and her sister Helena moved into a small structure in the cemetery, locked the gate, and posted a sign, "Trespass at your Peril," as they guarded the cemetery with a shotgun. She became the first woman to plead a case in the Supreme Court. However, in 1909 the court upheld Congress’s right to interpret the 1855 treaty differently and to sell the land. Sister of attorney Eliza Conley, who fought the United States government when they attempted to confiscate land that had an Indian burial ground of the Wyandotte tribe on it. The land which is in the middle of the downtown Kansas City Kansas shopping area, is prime real estate. Her and her sister moved into a small structure in the cemetery, locked the gate, and posted a sign, "Trespass at your Peril," as they guarded the cemetery with a shotgun. Her sister Eliza became the first woman to plead a case in the Supreme Court. However, in 1909 the court upheld Congress’s right to interpret the 1855 treaty differently and to sell the land. Shawnee chief famous for leading in war and in peace. Native Mountain Crow Chief. His name was A-Lek-Chea-Ahoosh which means "Many Achievements". In his early youth he was known as Swift Arrow and gained respect through his merits, exploits of bravery and war deeds. At 25, he became chief of the Mountain Crow. In 1876 he was the head of scouts for General George Crook as Crook was making his way to meet Custer. On the Rosebud River in Montana, he and his Indian scouts saved General Crook from a Custer fate. During the 1880s and 1890s he made several trips to Washington, D.C. which resulted in lease agreements with local cattlemen and fellow chiefs maintaining a friendly but firm stance with the United States. In 1917, he negotiated for right away of the Northern Pacific Railroad and government land payments for Crow land. Later he became a successful farmer and rancher and urged his tribal members to join the armed forces during World War I. Because he had no children, in 1924 he deeded his home and 40 acres to the government as a reminder of the friendship between the Crows and the whites. Oglala (Lakota) Sioux Indian Chief. Born Tashunca-uitco, even as a young man he was a legendary warrior. He stole horses from the Crow Indians before he was thirteen, and led his first war party before turning twenty. He fought in the 1865 to 1868 war led by the Oglala chief Red Cloud against American settlers in Wyoming, and played a key role in destroying Captain William J. Fetterman's 80-man patrol at Fort Phil Kearny, Wyoming in 1867. Crazy Horse earned his reputation among the Lakota not only by his skill and daring in battle but also by his fierce determination to preserve his people's traditional way of life. He refused, for example, to allow any photographs to be taken of him. He fought to prevent American encroachment on Lakota lands following the Fort Laramie Treaty of 1868, helping to attack a surveying party sent into the Black Hills by General George Armstrong Custer in 1873. When the War Department ordered all Lakota bands onto their reservations in 1876, Crazy Horse became a leader of the resistance. Closely allied to the Cheyenne through his first marriage to a Cheyenne woman, he gathered a force of 1,200 Oglala and Cheyenne at his village and turned back General George Crook on June 17, 1876, as Crook tried to advance up Rosebud Creek toward Sitting Bull's encampment on the Little Bighorn. After this victory, Crazy Horse joined forces with Sitting Bull and on June 25 led his band in the counterattack that destroyed Custer's Seventh Cavalry, flanking the Americans from the north and west as Hunkpapa warriors led by chief Gall charged from the south and east. Following the Lakota victory at the Little Bighorn, Sitting Bull and Gall retreated to Canada, but Crazy Horse remained to battle General Nelson Miles as he pursued the Lakota and their allies relentlessly throughout the winter of 1876-77. This constant military harassment and the decline of the buffalo population eventually forced Crazy Horse to surrender on May 6, 1877; except for Gall and Sitting Bull, he was the last important chief to yield. While Sitting Bull was pursued into Canada, Crazy Horse and the Cheyennes wandered about, comparatively undisturbed, during the rest of that year, until in the winter the army surprised the Cheyennes, but did not do them much harm, possibly because they knew that Crazy Horse was not far off. His name was held in wholesome respect. From time to time, delegations of friendly Indians were sent to him, to urge him to come in to the reservation, promising a full hearing and fair treatment. For some time he held out, but the rapid disappearance of the buffalo, their only means of support, probably weighed with him more than any other influence. In July, 1877, he was finally prevailed upon to come in to Fort Robinson, Nebraska, with several thousand Indians, most of them Ogallala and Minneconwoju Sioux, on the distinct understanding that the government would hear and adjust their grievances. At this juncture General Crook proclaimed Spotted Tail, who had rendered much valuable service to the army, head chief of the Sioux, which was resented by many. The attention paid Crazy Horse was offensive to Spotted Tail and the Indian scouts, who planned a conspiracy against him. They reported to General Crook that the young chief would murder him at the next council, and stampede the Sioux into another war. He was urged not to attend the council and did not, but sent another officer to represent him. Meanwhile the friends of Crazy Horse discovered the plot and told him of it. His reply was, "Only cowards are murderers." His wife was critically ill at the time, and he decided to take her to her parents at Spotted Tail agency. Even in defeat Crazy Horse remained an independent spirit, and in September 1877, when he left the reservation without authorization, to take his sick wife to her parents, General George Crook ordered him arrested, fearing that he was plotting a return to battle. Crow Indian. Private, Indian Scouts. Participated in the ill-fated Custer Expedition in 1876, and may be the only human survivor of the Custer Column. Also called Shay-shee-ahsh. Born on the Little Rosebud Creek, Montana Territory. Enlisted April 10, 1876 at Crow Agency, Montana, for six months with the 7th Infantry. Accompanied Lieutenant Charles Varnum, 7th Cavalry, on the trip to Crow's Nest, on June 26, 1876. Assigned to Custer's attacking column that afternoon, he may have witnessed the final moments of the attack. He carried the news of Custer's defeat to the rendezvous point with the steamer "Far West" and although he did not speak English (and no one on the steamer spoke Crow), conveyed the idea of the disaster to the 7th Cavalry. Western American Indian Outlaw. Born Bluford Duck, his Cherokee name was Sha-con-gah Kaw-wan-nu and he was called Blue Duck. Bluford "Blue" Duck is the figure that Larry McMurtry used in his novel "Lonesome Dove." None of the activities match in the book except for the outlaw connection which McMurtry felt fit well with the story line. His true story was, on June 23, 1884, in the Flint District of the Cherokee Nation, he and a fellow named William Christie, both drunk, rode up to where a farmer named Samuel Wyrick was working in his field. He emptied his revolver into Wyrick, reloaded and then fired again at an Indian boy who was working for Wyrick. He then rode over to a neighboring farm and shot at but missed the neighbor. He and Christie were arrested for the killing and were sentence to be hanged from Judge Issac Parker's gallows on July 23, 1886. Christie was cleared of the charge. Blue Duck's attorney, Thomas Marcum called attention to his client's case by the alleged involvement he had with Belle Starr in crime and cattle rustling. The alleged couple posed for a studio portrait but the involvement has been disputed. Marcum appealed for a lesser punishment of life in prison and Duck was committed to Menard Penitentiary at Chester Illinois on October 16, 1886 as inmate number 2486. Actress, Piute Indian native.ĘAt 121 years old, she is believed to have lived longer than any other person at Forest Lawn, Glendale. Nez Perce Indian Warrior. He was part of a four-man mission that traveled 2,000 miles from Idaho to St. Louis to meet explorer William Clark in order to learn more about the White man's Bible. Clark had befriended the Nez Perce tribe 25 years earlier on his and Meriwether Lewis' Corps of Discovery expedition. The Nez Perce people had given the starving explorers much needed supplies. He died a few weeks after meeting with Clark, and received Catholic rites and the Christian name of Paul at the time of his burial in the fall of 1831. Fellow warrior Speaking Eagle also died at the same time and is buried in the same mass grave. Clark had befriended the tribe 25 years earlier on his and Meriwether Lewis' Corps of Discovery expedition. The Nez Perce people had given the starving explorers much needed supplies. He died a few weeks after meeting with Clark, and received Catholic rites and the Christian name of Narcisse at the time of his burial in the fall of 1831. Native Lakota Hunkpapa Sioux War Chief. Known as Matohinsda, “Bear Shedding His Hair” in his youth, he acquired the name Pizi “Gall” when he attempted to eat the gall bladder of an animal. He distinguished himself early as a warrior and hunter, fought at the Battle of Big Mound with Inkapudta and was with Crazy Horse at the Battle of the Rosebud against General George Crook. He eventually became Sitting Bull's military chief, and led attacks on army troops along the Yellowstone River in 1872 and 1873. At the 1876 Battle of the Little Bighorn, he rallied his warriors in the face of Major Reno's attack against the First Nations village. After Reno's retreat he turned his attention to the main body of the 7th Cavalry and joined forces with Crazy Horse to defeat George Armstrong Custer. Following the battle, he accompanied Sitting Bull in his retreat into Canada. He finally surrendered on January 3, 1881, and was settled on Standing Rock reservation. There he lent his prestige to the reservation farming program and became an active supporter to educate Indian children in special schools. In 1889 he became a judge on the reservation's Court of Indian Offenses. The once mighty warrior spent the rest of his life as a distinguished Lakota and peaceful farmer. Choctaw Indian Chief. Served as Chief of the Choctaw Indians from 1878 until his death, in office, in 1880, only seven months before his term was to expire. Educated at Norwalk and Spencer Academies, he became an attorney, a county judge, a district judge and a presiding officer of the Choctaw Nation Supreme Court. The town of Garvin, Oklahoma in McCurtain County was named for him. The location of his burial place lies 3/4 miles north of Iron Stob Store just off Highway 37 (or 4 miles south of Garvin just off Highway 70) in western McCurtain County. Native American Indian Leader. Apache Shaman and Geronimo was the leader of the Mescalero tribe of Apache Indians. He was once Chiracahua (but not the leader), but escaped from the reservation to form his own tribe of Apaches. He outfought and evaded the US Army for many years. His Apache name was Goyathlay, which meant "the Smart One." The Mexicans called him Geronimo, which means "Jerome" in Spanish. He raided in both Mexico and in the United States, and was hunted by both governments. In 1877, the US Government rounded up the Apaches, and settled them on the San Carlos Reservation in Arizona, to learn farming and cattle ranching. Many Indians did not like this way of life, and were unhappy with the failure of the Bureau of Indian Affairs to keep their promises. In 1878, Geronimo left the reservation with his followers, only to return in 1880. In 1882, Geronimo left again, fleeing to the Sierra Madre Mountains in northern Mexico, from which they would raid into the US. During one of his raids into Arizona, General George Crook entered Mexico with a small force of only 50 soldiers, discovered Geronimo's hideout, and captured it with all of the Apache women and children. Upon his return to his hideout in Mexico, Geronimo was forced to surrender to General Crook. In exchange for Geronimo's surrender and return to the White Mountain Reservation, General Crook promised to look into Apache grievances, a promise that he kept. With just 50 soldiers, Crook had captured 123 warriors and 251 women and children, and restored the Apache to their reservation. Although the Apaches kept the peace on the reservation, many whites thought General Crook too soft on the Indians, and rumors and newspaper stories convinced the public that Geronimo was a deadly savage, raiding farms and ranches, and murdering settlers everywhere. On May 17, 1885, Geronimo and his followers left the reservation, only to surrender again to General Crook on March 25, 1886. On the way back to the reservation, and fearing captivity, Geronimo and 24 Apache followers escaped again. General Crook was reprimanded by the War Department, and replaced by General Nelson Miles. General Miles immediately dispatched 5,000 soldiers, and nearly 5,000 civilian irregulars, after Geronimo, until the Apaches finally surrendered nearly a year later. Geronimo and his followers were imprisoned at Mount Vernon Barracks, near Mobile, Alabama, until 1894, when the remnants of the Chiricahua were relocated to Fort Sill, Oklahoma. 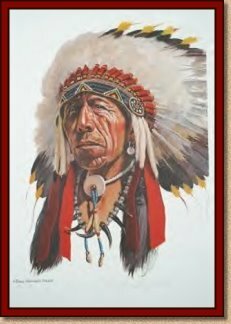 Native American Chief, Apostle Islands, Chippewa Indians. Great Buffalo was faced with overwhelming expansion by Americans during his days as chief. It was a problem what to do with Indians and the solution was a treaty either forced upon them by war or trickery to banish them to a reservation on land not suitable for habitation. The Ojibwe were the original inhabitants of this Lake Superior area with their main village being Madeline Island, one of the Apostle group. President Zachary Taylor ordered the Indians removal. In the company of Ben Armstrong, a trapper-frontiersman who had married into the tribe while learning the language, the chief with six braves began a harrowing trip beginning in canoes to Washington in an attempt to countermand this edict. President Taylor died during the journey but upon arrival in Washington, President Fillmore agreed to meet with the party. The Chief, ninety one at the time, went into a lengthy oration translated by Armstrong. A treaty resulted giving the Ojibwes The Red Cliff Reservation on the shores of Lake Superior. He died at the age of ninety five on Madeline Island. Baptized a Catholic, a mass was celebrated and his casket was carried from his home to the burial site. Benjamin Armstrong ordered and placed a tombstone on his grave and it remains to this day. The Chief is remembered in the U.S. Capitol where two busts are on display. One of marble carved from life and another copied in bronze. Mohawk orator, magician, and medicine man. According to Amerindian tradition he was thought to be the founder of the League of Five Nations (Iroquois League), who's base was located now where Cazenovia, New York stands. His story was told in many books and films. The poem, "The Song of Hiawatha" (1855) was written for him by Henry Wadsworth Longfellow. She was the first Native American (Northern Paiute) woman known to secure a copyright for her book and to publish it in the English language, "Life Among the Piutes: Their Wrongs and Claims." Her Paiute Indian name was "Thocmetony" or Shell Flower. She worked throughout her life to be an advocate between her people and the white people, to defend Paiute rights, and to create an understanding. She was a lecturer, activist, school organizer, and an author. By the time she was 14 she could speak five languages, English, Spanish and 3 Indian dialects. She attended convent school at San Jose, California acquiring more knowledge and experience in the new culture. She pleaded the Indian's cause in Washington, D.C., giving more than 400 speeches to gain support for the Paiutes. Many of her speeches were given on the East Coast through the support of Elizabeth Peabody and Mary Peabody Mann. She was the founder of "Peabody's Institute," a school for Indian children. After the death of her second husband, the school closed. With her health failing, she moved to Idaho to spend her last days with her sister Elma. Native American Chief. He was a Bannock War Chief and United States Army Indian Scout serving under General Oliver O. Howard in the 1877 Nez Perce Campaign, and under General George Armstrong Custer in the Rosebud Sioux War. The Bannock War of 1878 began when the Fort Hall Bannock Indians under Chief Buffalo Horn, found that settlers had cut up the marshes into fields, allowing livestock to destroy the camas roots that had been one of the Indians' major food sources. This led to a series of attacks in 1878. Native American Chief. Sioux name "Etokeah." Although very little is known about Hump's early life, he eventually rose to become a Chief among the Miniconjou Sioux and was an active participant in the Red Cloud war. With Crazy Horse at the Rosebud Battle against George Crook, Hump led his Miniconjou Sioux, helping stop the column in their trek to meet Custer prior to the Little Big Horn. At the Little Big Horn, when the alarm was sounded, Hump jumped onto an unknown mount, and it threw him to the ground. Hump rushed, mounted another horse and charged toward the soldiers. His horse was shot from under him and a bullet entered above the horse's knee and went further into Hump's hip. 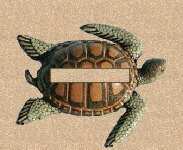 Hump was strained there due to the wound and did not participate in the main battle. Later, Hump went to Canada, and his band returned to the United States, the last of all the bands to return. On the reservation when other tribes had adopted white dress and housing, Hump's band settled at Cherry Creek in South Dakota and maintained the old ways using lodges and traditional clothing. On the reservation when the authority of other chiefs waned, Hump continued to assert leadership over his band. Some said that Hump was feared by the whites even more than Sitting Bull. When the Ghost Dance religion surfaced among the Sioux, the military did not dare arrest Hump. Instead, they reassigned Captain Ezra Ewers, a trusted friend of the chief, to Fort Bennet in South Dakota. Ewers rode the 60 miles to Hump's camp at Cherry Creek. Impressed with Ewer's courage, Hump listened to his message and avoided the Ghost Dance religion. After the Wounded Knee Massacre, Hump along with other prominent Sioux went to Washington, DC pleading for a peaceful end to the tragedy. Interestingly enough, it was also Hump who taught the basic lessons of warfare to his better-known student, Crazy Horse. Was a chief of the Fox or Mesquakie tribe which resided in the Iowa area. During 1831, he fought in the Black Hawk War against the United States. Following the war Joc-O-Sot made his way east to Cleveland in the early 1830's. Here he began leading hunting and fishing expeditions. He made the acquaintance of a theater promotor, Dan Marble. He joined Marble's theatrical group, touring various cities performing in plays which represented Native American life. Moses Keokuk (Wunagisa) was principal chief of the Sac & Fox Nation at the time of the ceding of the tribal lands to the U.S. Government in 1891. After a series of removals to Iowa, Missouri and Kansas, the Sac & Fox were finally settled on part of the lands given up by the Creeks, between the Cimarron River and the North Canadian, primarily in present day Lincoln County. Keokuk oversaw the sale of these lands to the federal government which resulted in the land run of Sept. 22, 1891. Lincoln and Pottawatomie Counties date their beginning from this run. Cheyenne Chief. The body that is buried at this site is that of an unknown Native American woman. Inscription: The unknown who lies here is in commemoration of Chief Black Kettle and the Cheyenne and Arapaho tribal members who lost their lives in the Battle of the Washita. Native American Indian, Medicine Man and Ghost Dancer. Born into the Oglala band of the Lakota or Teton Sioux. First wife was a Cheyenne. He was highly respected within the Cheyenne Nation. Married into the Miniconjou band of the Lakota or Teton Sioux. Became a Miniconjou band chief. Mother's name: Wood Pecker, Father's name: Black Fox. Nephew of Sitting Bull and cousin of Crazy Horse. Indian Council appointed him along with his brother-in-law Short Bull to attend a religious Ghost Dance Ceremony in Utah, held by Wovoka, a Piute Indian. After learning the Ghost Dance, Kicking Bear along with Short Bull taught the ritual to the Sioux Nation. He delivered a persuasive speech to the Sioux Nation assuring and sealing their belief in the Ghost Dance ritual. This movement led indirectly to the Wounded Knee Massacre. After the Wounded Knee Massacre he was arrested and sent to Fort Sheridan, Illinois and served a year in prison. After agreeing to join Buffalo Bill Cody's Wild West Show his sentence was commuted. He toured with Cody's Wild West Show for a year in Europe. Humiliated, he returned to his family on the Pine Ridge Reservation. Kicking Bear fought honorably in the Black Hills Wars, specifically, in the Battle of the Little Big Horn along side Sitting Bull, Crazy Horse, and Rain In The Face, against Custer and his 7th Calvary. Indian warrior. Failed peace maker. His name was Tene-angop'te which means "The Kicking Bird". He was, also, known as Watohkonk - "Black Eagle". His grandfather was a Crow captive who had been incorporated in the Kiowa tribe. Kicking Bird's avocation was peace with the Whites since he saw the hopelessness warfare would bring. Kicking Bird signed the Treaty of Medicine Lodge in 1867. His friendly ways, however, did bring about much hope: the government did not keep a promise to free Kiowa chief held captive, horses and cattle were stolen by the Whites and buffalo hunters encroached on their reservation land. His leadership waning, Kicking Bird led a group of warriors to victory against troops in Texas. The Kiowa tribe became divided when Lone Wolf, another Kiowa chief, gathered forces and waged war. Peace was still Kicking Bird's main objective and when a school was being built at his request, Kicking Bird died. His friends say he was poisoned. Native Northern Cheyenne Chief. He was originally known as Wahiev which means Morning Star. He obtained the name Dull Knife after a battle with a Sioux warrior who had a buffalo hide shield his knife could not pierce. From that point the Sioux called him Tamela Pashme - Dull Knife. He was known for both honesty and courage as well as in his war record. He fought in the Cheyenne-Arapaho War in 1864–65 Colorado, in the Sioux Wars for the Northern Plains in 1866–68 and in Red Cloud's War for the Bozeman Trail. He was a signer of the 1868 Fort Laramie Treaty that deeded Native American land to the white settlers. In 1875 he allied with the Sioux in their desperate defense of the Black Hills country and against confining the Indians upon reservations. In 1876 after the defeat of Custer at Little Big Horn, he with the Cheyenne surrendered and they were sent to a reservation in Oklahoma. Determined to return to home, in 1878 he led what was left of his people back to Montana but were eventually caught by the US Army. When he and his people refused to return to Oklahoma, they made a daring escape in which many were killed and recaptured. Dull Knife with a few others got away and made it to the safety of the Pine Ridge Reservation in South Dakota. Nisqually headman and a signer of the 1854 Medicine Creek Treaty. Hung for his part in the rebellion caused by being assigned unacceptable reservation lands. Due in part to his efforts, the Nisqually people now reside on their ancestral lands. Was known as the Little Chief, he first served as a warrior under his grandfather , the famous Indian Sitting Bull. He eventually became an actor, joining Col. Joe Miller's 101 Ranch Show which played to thousands and performed in movies. One such movie was "The Covered Wagon". He also performed in Buffalo Bill's famous Wild West Show. Before his death at Chief's request, his widow sent to their children in North Dakota his war bonnet, an enormous string of elk teeth, his favorite weapons, and other personal effects. The Chief's picture was on his head stone, but has since disappeared. Chief Little Turtle was the War Chief of the Miami Nation. He led the Native American military force who defeated General Arthur St. Clair at Fort Recovery on November 3, 1791. Chief Lone Wolf was a fierce Kiowa warrior. In later years, he headed up a church and led his people to Christianity. The town of Lone Wolf, Oklahoma was named for him. Native American Chief. Along with Chief Joseph the Younger, he directed the 1877 Nez Percé retreat from eastern Oregon into Montana and onward to Canada. The son of a prominent Nez Percé chief, Looking Glass had bitterly resented white encroachments on his ancestral lands, but opposed going to war with the United States over its plans to force his people onto the small reservation assigned to them at Lapwai, Idaho. When the Nez Percé and the U.S. Army first clashed at Whitebird Canyon on June 17, 1877, Looking Glass was already living on the Lapwai reservation, as he had agreed to do. Nevertheless, General Oliver Howard believed that Looking Glass would soon join the fighting, and he sent a detachment of troops to arrest him. Howard's plans backfired, however, for Looking Glass eluded arrest and fled the reservation to join Joseph and his fugitive band just as Howard had feared. For both better and worse, the Nez Percé flight bore the mark of Looking Glass's leadership. A respected battlefield commander, he convinced the band to flee to Montana, despite Joseph's opposition, and then persuaded them to stop at Big Hole, where he incorrectly believed they would be free from attack. After soldiers under the command of Colonel John Gibbon surprised the Nez Percé there on August 9, inflicting heavy casualties, Looking Glass lost much of his prestige as a military leader. Nearly two months later, when the Nez Percé were finally surrounded by Colonel Nelson A. Miles's troops in Northern Montana's Bearpaw mountains, Looking Glass remained stubbornly opposed to surrender. Shawnee princess and wife of Louis Lorimier, founder of Cape, Girardeau, Mo. Her grave is the oldest marked grave in the cemetery. Noted circus equestrian. He toured with Ringling Brothers and Barnum and Bailey Circus for twenty-seven years before co-founding the Sailor Circus. Native American Tribal Chief. Eastern Chiricahua or Mimbreno Apache War Chief of Southwest. His Spanish name means "Red-Sleeves", so named because he always wore a red shirt. Standing over 6 feet, he was unusually tall for an Apache Indian. He was considered courageous, wise, generous, and always sought peace. Some believe he was a legend in his own time. Mangas Coloradas was a peaceful man until 1837 when the Mexican Government offered a $100 bounty for each Apache Indian scalp. This resulted in a massacre of his band or tribe by greedy Anglo-American fur trappers. Later, American gold miners of the Pinos Altos mining camp in New Mexico tied him to a tree and whipped him with bull-whips, further intensifying his hatred of the white race. In 1862 during a raid against white settlers in his homeland he suffered a gunshot wound to the chest; surviving, he once again sought peace. Although he signed many treaties none of them were honored by the United States Government. Also in 1862, he along with his son-in-law Cochise, defended Apache Pass against United States General James H. Carleton and his troops. Mangas Coloradas was a skilled strategist in guerrilla warfare. Chief Green McCurtain was one of three sons of Cornelius McCurtain and Mahyia Belvin, later called Amy. His mother was a granddaughter of the legendary Sho-Ma-Ka, a captive of the Choctaws after a retributive massacre of her tribe, the Sha-chi-homas, by the Chickasaws and Choctaws in the late 1700s. They migrated to Indian Territory in 1833 in one of the removal caravans known as the Trail of Tears. They settled in Skullyville, and engaged in farming and stock raising. From the time of the adoption of the new constitution of 1860, until the conclusion of the political life of the old Choctaw government, the three sons Green McCurtain, Jackson Frazier McCurtain and Edmund McCurtain were to figure prominently in tribal leadership, serving the Choctaw people through times of great change, with diligence, farsightedness, and unfailing honesty. Chief Green McCurtiain enjoyed and deserved the love and confidence of the Choctaw people and the greater part of his life was given to their service. He held many positions of honor and trust in his Nation. He was School trustee, Representative, Senator, District Attorney, national Treasurer, and Delegate to Washington D.C. Native American Figure. Half Creek Indian, he fought with General Andrew Jackson at Horseshoe Bend, Alabama during the Creek wars of 1813-1814. He was killed by other Creek Indians for selling their land to the U.S. government. Wampanoag Indian Cheif. Known as "King Phillip", he was one of the most influential Native Americans in the early days of the colonies. His most famous action was starting what is known as "King Phillip's War" in 1675. His father, Massasoit, was the chief that welcomed the Mayflower landing party in 1620. After the death of Massasoit, Phillip's older brother, Wamsutta (also known as "Alexander") was Sachem for a short time before his "questionable death" after being forcefully questioned by Josiah Winslow in Plymouth, Massachusetts. Phillip became sachem upon his brother's demise and held bitter relations with the colonists. The war raged for over a year until Captain Benjamin Church and a small party of soldiers and Indians who sympathized with the colonists infiltrated Phillip's camp at "Montaup" known now as "Mount Hope" In Bristol, Rhode Island. The war was ended when Phillip was assassinated in his own camp. He was then drawn and quartered. One of his hands was sent to Boston, the other was sent to England and his head was displayed on a pike in Plymouth as both a trophy and a warning. Native American Apache War Chief. His name was Kas-tziden among the Mimbreno Apache in southern New Mexico. He had the longest fighting career of any of the Apache warriors. He was always steady and reliable in battle and fought alongside Mangas Coloradas until Mangas was killed in 1863. He then aligned with Victorio in his raids through Texas and Mexico during the Indian Wars. When Victorio was killed in 1880, he formed his own war party with the Warm Springs Apaches. Under his leadership the Mimbreno and Warm Springs Apaches raided isolated settlers and army supply trains. The army's pursuit of him was futile, he was a fine strategist and eluded or defeated the militia. In a surprise attack he was captured and sent to the San Carlos Reservation. He soon escaped and joined with Geronimo in Mexico. He kept his band out of the hands of the army for about a year and surrendered in March, 1886. He was sent to Fort Marion, Florida because General George Crook considered him a danger and feared the threat he would organize another hostile band. Native Cheyenne War Chief. His name was Woqini, for Arched Nose and he was one of the most esteemed warriors of the Plains Indian Wars of the 1860s. His bravery and fearlessness was in descriptions of the Battle of Platte Bridge and the Powder River Expedition, both in 1865. In Battle he wore a magnificent headdress, made with one buffalo horn and a long tail of red and black eagle feathers. On September 17, 1868 he was with a party of Cheyenne and Sioux that attacked a troop of Major George A. Forsyth's Scouts led by Lt. Beecher on the Republican River near the Colorado-Kansas border. The scouts retreated to a small sandbar in the Arickaree Fork, which became known as Beecher's Island. The Indians greatly outnumbered the scouts but they were able to hold off there charges. Roman Nose unhesitatingly agreed to lead a charge, as he rode past the riverbank, he was shot and killed. Great Warrior of the Cherokees. Cherokee Indian who died in the late 1830's. Civil War Union Brevet Brigadier General. Full blooded Seneca Indian (whose Indian name was Donehogehweh) who served as a Union Army Officer during the Civil War. Commissioned a Captain, US Volunteers, he was assigned to the staff of Lt. General Ulysses S. Grant, serving first as an Assistant Adjutant General, then as General Grant's Military Secretary. He penned the terms of surrender at Appomattox Courthouse. He was brevetted Brigadier General, US Volunteers on April 9, 1865 for "gallant and meritorious services during the campaign terminating with the surrender of the insurgent army under General Robert E. Lee". On March 2, 1876, he received the brevet of Brigadier General, US Regular Army for "faithful and meritorious services during the war". From 1866 to 1869, he served on General Grant's staff with the rank of Colonel, US Regular Army. Later, he became U.S. Commissioner of Indian Affairs, and served as Chief of the six Iroquois Nations, consisting of the Tuscaroras, Cayugas, Senecas, Mohawks, Oneidas, and Onondagas. Parker had studied law, passed the N.Y. State Bar Exam, but was never allowed to practice law, because of his ancestry. He then became a civil engineer. He is buried near friends, Red Jacket, Little Billy, Young King, Tall Peter, Destroy Town, and Louis Bennett, also known as Deerfoot.